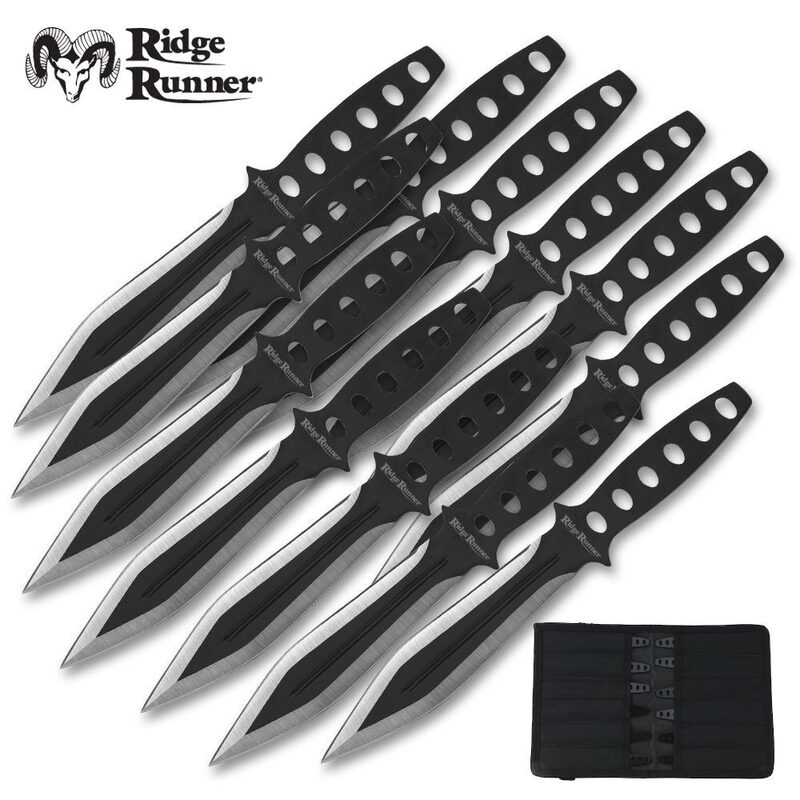 A dozen double edged throwing knives ready to sink into the bullseye of your target! Each knife features a piercing point, dual edges, center blood groove, two-tone black and satin finish, and full tang construction with handle cutouts. Forged from a single piece of 440 stainless steel. 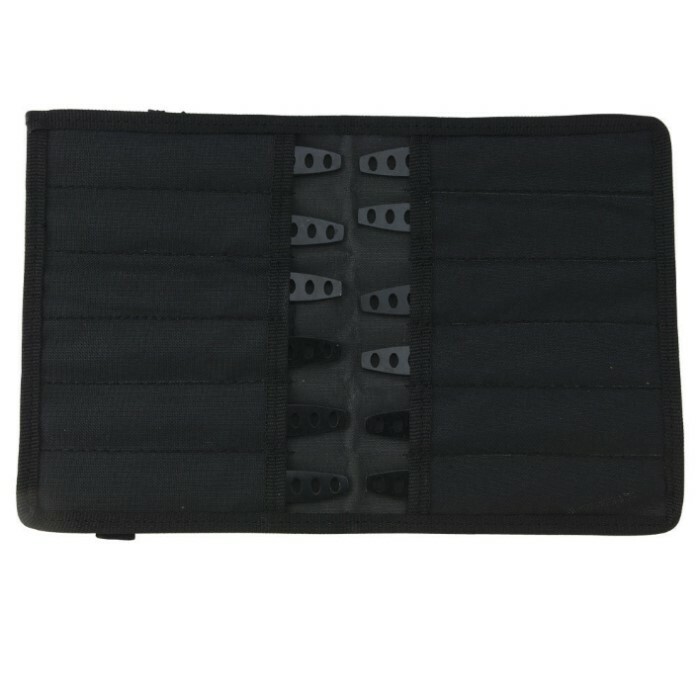 The 12 knives are bundled with a black nylon sheath for easy of storage and transport to your target range. Measurements: 3 1/2 in. blade, 6 in. overall. I bought these on a whim but I am VERY glad I did. They are heavier than I expected and predictable when you throw them. Granted they are smaller than I thought but at less than $2 a knife they are great. Perfect if you are learning how throw knives and if you have a fair amount of experience ( as I do) they will do what you want once you get the hang of them. Only down side is that they will break eventually but considering the price it is worth it. Will buy again. I bought my set a month ago and i love them so far. They haven't broken and I've used them. Edges arent ridiculously sharp, but the tips are the thing to be wary of. One poked through its slot and sliced my thumb webbing wide open and I barely felt it until I saw the blood dripping on my table. Be careful, but an awesome buy nonetheless for the price. I purchased these and just received them. Be careful. The blades themselves aren't ridiculously sharp, but the tip of one poked through the roll and sliced the webbing of my thumb. The tips are sharp. So be careful again, but otherwise I like them so far. I bought these for a Men's Ministry activity as a test run to see how they would work. They worked out fine. For the price - the size and quantity in the package was exactly what I expected. They are a decent quality. My next purchase will be fewer (6) and larger in size (8-12) to see if that is easier to throw and get to stick. The weight is nice, but I've only had them for a week and a half and 2 have already broken at the hole nearest the blade. Needless to say, I am quite disappointed. I'm not surprised, I should've known better. For what you pay, it's an alright set of toys. Bit more lightweight than I was expecting. Didnt fly very well but once you figure out the knives they do okay. Good for fun no expectation throwing.